Jade Ell - Ellen, Mourning This Morning is a release full of tight lyrics and polished arrangements, Jade shines like never before. Through her storytelling, this pop, rock, folk diva has recorded an emotionally inspiring and elegant release. 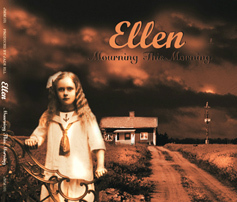 Jade Ell - Ellen, Mourning This Morning was produced by Jade Ell and released on the indie JadeMade Songs label. The release Ellen, Mourning this Morning marks the third solo release by this talented singer/ songwriter/ performer/ producer (read the Music Scene section for a review of Jade's second release, Jade Ell - Methods (of a hostage negotiator), and an interview with Jade, Jade Ell - Interview). This is an emotionally charged recording that reflects Jade's best work ever, and shows why this pop, rock, folk diva is in demand as a performer, songwriter, and collaborator. While Jade was writing the tracks that eventually became Ellen, Mourning This Morning, I had the opportunity to talk with her one-on-one, and I learned about her past and her linage, which she was weaving into her writing. So, when I heard the finished product I could tell that she had poured every feeling and emotion she had into crafting this poignant and powerful release. The release opens with the short instrumental Mourning Prelude that sets the tone with an evocative cello passage. The track Make it Disappear is a story of a dream where the person wonders "tell me it's not there, make it disappear,...say it's just a creation of my own mind." Jade's vocals and her arrangement project like she is in your mind, a bit distant, a bit in the background, but never far removed. The track Hold the Gate captures that feeling of being vulnerable when you are lost and searching for answers that you know will remain unanswered. Jade exposes all of the vulnerabilities that a person experiences and how they look for ways to escape what they cannot escape. The track captures the treadmill that many people are running, how they are moving and dealing with life's unexpected challenges, but are they moving forward or just fooling themselves? Exceptional lyrics with depth and meaning, complemented by an arrangement that emphasizes each feeling and emotion make this song so powerful. The death of a loved one is always hard and affects people in many different ways. For Jade, the passing of her mother lead to the track April 14th, which is one of the most tender and moving tracks that I have heard. She has an ability to delve into many different feelings through her lyrics and her arrangement. You know after one listen to this track that she found solace from her music. Man Overboard features touching lead vocals by Lise Blaase with Jade on backing vocals and keyboards; this ballad folk track is fed by their combined vocals with the musical arrangement the place setting. The track Guilty As Charged shows off Jade's prowess as she layers in different vocals to create a gospel sound complemented by the organ. Wedding Day is a song that reaches depths that I have not heard from Jade in the past; a beautiful arrangement that elicits attention to each passage and each note. Jade likes to venture with her music and Pour Me A Cup starts off like a circus barker calling out to the audience as she weaves her way through a fanciful track and sings about never wasting time with self pity, you need to get out there and make things happen. Other tracks include; The Postcard, Center of Myself, Borrowed Days, The Rain Song, My Cocoon, and For Regina. This is a release full of twists and turns as Jade the storyteller takes us on a journey of finding yourself and dealing with the challenges that life puts in front of us. Her lyrics are rich and expressive; her arrangements are tight, vivid, and elegant. Websites where you can procure Jade Ell - Ellen, Mourning This Morning are Klick Track, Trade Bit, Ginza, CDON, Kulturbutik, Plugged Webshop, and Jade Ell. © May 2010. Luxury Experience. www.LuxuryExperience.com. All rights reserved.